n/a Hindi. Asura is a figure in Hindu myth. Bitmon + Win Ratio 40% Nothing can stand against his angry fists of fire! Has the power of "fighting"
Unimon + Win Ratio 40% He can see in all directions, he won't let anyone get away with an act of evil! Has the power of "fighting"
Ogremon + Win Ratio 40%! 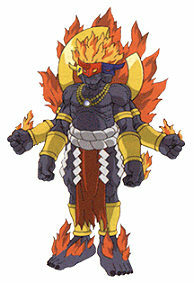 Asura Kami Kobushi is the kanji reading, which was translated by Megchan, and literally means, Asura God Fist. The furigana reads Asura Shin Ken. Kidoairaku was translated by Megchan as Human Emotion.